Sessions has had a rocky relationship with Philadelphia during the first nine months of his tenure, mostly over the issue of sanctuary cities. The attorney general spoke about violence crime prevention and using federal prosecutors to assist local cases in a speech before an annual conference of the Major Cities Police Chiefs Association. It was held at the Pennsylvania Convention Center in Philadelphia. 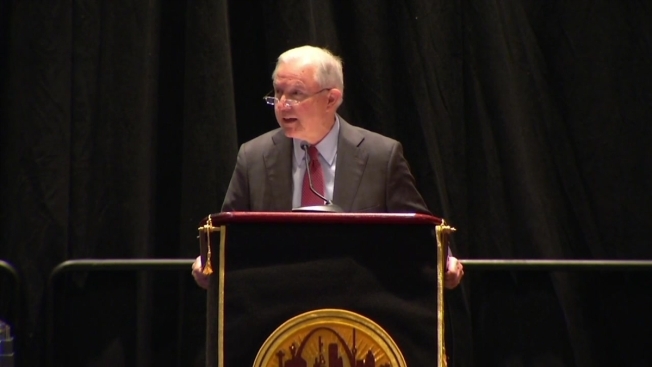 Attorney General Jeff Sessions, in a speech Saturday to police chiefs from across the country gathered in Philadelphia, said forging new relationships between local and federal authorities will help reduce crime in communities across the country. It was the first of two speeches Sessions will give this week in a city that his Department of Justice has publicly battled for most of the last nine months over Philadelphia's sanctuary city approach to immigration enforcement. His appearances are part of a weeklong conference of the International Association of Chiefs of Police. Sessions spoke about the federal Project Safe Neighborhoods program and other initiatives to reduce violent crime by the Department of Justice, including the use of federal prosecutors to aid in cases by local authorities. "Forging new relationships with local prosecutors and building on existing relationships will ensure that the most violent offenders are prosecuted in the most appropriate jurisdiction," Sessions said. "But our goal is not to fill up the courts or fill up the prisons. Our goal is not to manage crime or merely to punish crime. Our goal is to reduce crime." Sessions has had a rocky relationship with some of America's large cities during his tenure at the DOJ, with Philadelphia among the most notable. He and Mayor Jim Kenney have traded barbs over the city's local immigration enforcement policies. The Trump Administration's DOJ has consistently labeled Philadelphia as in violation of federal requirements for notifying federal immigration officials when city police comes in contact with undocumented immigrants. The city has argued that it meets all of demands of the federal statutes and any of the Trump Administration's additional requests are not only not required by law, but would hurt the ability of local police to fight crime. The City of Philadelphia is suing the DOJ in federal court over the disagreement. In his speech, Sessions talked about local and federal cooperation in crime-fighting efforts. "Partnering with community leaders, and taking the time to listen to the people we serve really works. I remember, when I was a U.S. Attorney, my office prosecuted a gang in Mobile. When the case was over, community leaders asked for a community meeting to talk about how we could further improve the neighborhood," he said. "We developed a practical plan based on the requests of the people living in the neighborhood. It was a city, county, state, and federal partnership using existing resources to fix the community." A large group of protesters, describing their demonstration as "Abolition Weekend," held a rally outside the Pennsylvania Convention Center at noon during the Sessions speech. Police say at least two officers were injured during confrontations with some of the protesters and that arrests were made, though they did not reveal the exact amount.